Play hide-and-seek with Momo, the bandana-wearing, head-tilting border collie who loves to tuck himself away for the stunning photographs taken by his BFF Andrew. The pair’s first books—Find Momo, Find Momo Coast to Coast, and the board book Let’s Find Momo!—explored landmarks and little-known places across the US and Canada. This new addition features beautiful cities and landscapes throughout Europe. Join Andrew and Momo on their travels to Spain, Portugal, Italy, France, the UK, and more. See if you can spot Momo concealed in picturesque neighborhoods, among ancient ruins, around castles and cathedrals, at legendary attractions, and in off-the-beaten-path locations that only these seasoned travelers could find. 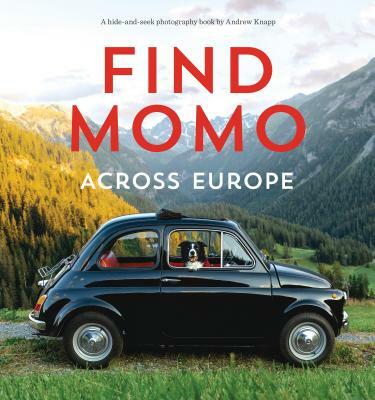 It’s the grand tour of Europe you’ve always wanted—with Momo’s cute and happy face waiting for you at every destination. Andrew Knapp is a freelance interface designer, photographer, and tireless traveler from Northern Ontario. His Instagram feed featuring photographs of his border collie Momo is an internet sensation, with 575,000 followers and counting. Momo is Andrew’s BFF, an excellent traveling companion, and a genius at hiding in beautifully composed landscape photography. Let’s Find Momo is his third collaboration with Andrew, following Find Momo (Quirk, 2014) and Find Momo Coast to Coast (Quirk, 2015). Praise for Let’s Find Momo!